To Cite: Khodavaisy S, Rezaie S, Noorbakhsh F, Baghdadi E, Sharifynia S, et al. Effects of Pistacia atlantica subsp. kurdica on Growth and Aflatoxin Production by Aspergillus parasiticus, Jundishapur J Microbiol. 2016 ; 9(7):e35452. doi: 10.5812/jjm.35452. Background: Aflatoxins are highly toxic secondary metabolites mainly produced by Aspergillus parasiticus. This species can contaminate a wide range of agricultural commodities, including cereals, peanuts, and crops in the field. In recent years, research on medicinal herbs, such as Pistacia atlantica subsp. kurdica, have led to reduced microbial growth, and these herbs also have a particular effect on the production of aflatoxins as carcinogenic compounds. Objectives: In this study, we to examine P. atlantica subsp. kurdica as a natural compound used to inhibit the growth of A. parasiticus and to act as an anti-mycotoxin. 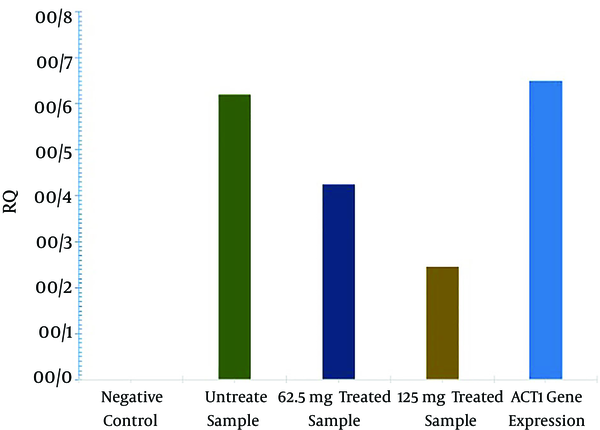 Materials and Methods: In vitro antifungal susceptibility testing of P. atlantica subsp. kurdica for A. parasiticus was performed according to CLSI document M38-A2. The rate of aflatoxin production was determined using the HPLC technique after exposure to different concentrations (62.5 - 125 mg/mL) of the gum. The changes in expression levels of the aflR gene were analyzed with a quantitative real-time PCR assay. Results: The results showed that P. atlantica subsp. kurdica can inhibit A. parasiticus growth at a concentration of 125 mg/mL. HPLC results revealed a significant decrease in aflatoxin production with 125 mg/mL of P. atlantica subsp. kurdica, and AFL-B1 production was entirely inhibited. Based on quantitative real-time PCR results, the rate of aflR gene expression was significantly decreased after treatment with P. atlantica subsp. kurdica. Conclusions: Pistacia atlantica subsp. kurdica has anti-toxic properties in addition to an inhibitory effect on A. parasiticus growth, and is able to decrease aflatoxin production effectively in a dose-dependent manner. Therefore, this herbal extract maybe considered a potential anti-mycotoxin agent in medicine or industrial agriculture. Aflatoxins (AFs) are carcinogenic, mutagenic, and teratogenic metabolites mainly produced by Aspergillus flavus and the very closely related species A. parasiticus (1). These mycotoxins can grow on a wide range of food commodities, including cereals, peanuts, and crops in the ﬁeld, but also during postharvest operations and storage (2). The group of AFs includes B1, B2, G1, and G2, while AFBs include AFB1 and AFB2, and AFGs include AFG1 and AFG2 (3). AFs are potent hepatotoxic, teratogenic, and mutagenic metabolites that are now well-recognized as a public health hazard (1, 4). Although some synthetic fungicides have been improved to protect crops against AF production, there are some proven indications that these are themselves hazardous to human health (5). Therefore, using natural sources is an affirmative approach to protecting from fungal infections in agriculture (6). A medicinal herb, Pistacia atlantica subsp. Kurdica, has been traditionally used as a therapeutic agent for infections (7-9). The genus Pistacia belongs to the family Anacardiaceae, and among 15 known species of pistachios, only three grow in Iran: P. vera, P. khinjuk, and P. atlantica (10, 11). P. atlantica has three sub-species: mutica, kurdica, and cabulica (11). This plant is an evergreen bush that grows native in some southern and central American and eastern Mediterranean countries (10). P. atlantica subsp. kurdica thrives particularly around the Zagros mountains in Iran (10, 12). The gum of P. atlantica subsp. kurdica is obtained as an exudate after crushing the trunk and branches, and has numerous qualities. The gum of this plant is used in medicine, with many researchers reporting that it possesses considerable antimicrobial activity (12, 13). The aim of this study was to evaluate the effects of P. atlantica subsp. kurdica, as a natural compound, with regard to antifungal activity and inhibition of AF production in A. parasiticus infections. Industrial-grade gum of P. atlantica var. kurdica was obtained from Saghez Sazi (Van) (Kurdistan, Iran) in the summer of 2014. The gum was obtained as an exudate of the trunk and branches. The A. parasiticus strain (American type culture collection 15517) was incubated at 28°C for 72 hours on Sabouraud dextrose agar (Germany, Merck). In vitro antifungal susceptibility testing for the determination of minimum inhibitory concentration (MIC) was performed according to recommendations provided in the clinical and laboratory standards institute (CLSI) M38-A2 document, with some modification in gum concentration (14). RPMI 1640 medium (Sigma chemical Co.) was buffered to pH 7.0 with MOPS (Sigma), with L-glutamine and without bicarbonate. The gum of P. atlantica var. kurdica was dissolved in water to reach a concentration of 500 mg/mL. It was then diluted to achieve concentrations of 500 to 15.6 mg/mL (500, 250, 125, 62.5, 31.2, and 15.6 mg/mL). The concentration of fungal spores was calculated using the hemacytometry method, and finally adjusted to 2x concentrated suspensions in such a way that each test well contained 5 × 104 colony-forming units (CFUs)/mL. Next, 100 μL of fungal suspension was added to the plates. Negative (only RPMI 1640 medium) and positive controls were also run alongside each experiment. The plates were incubated for 48 - 72 hours at 35°C. The MIC endpoints were determined as the lowest concentrations that prevented any recognizable growth, mostly based on the antifungal capacity of the gum (100% inhibition). The amount of AFs produced by A. parasiticus alone and in combination with different gum concentrations (62.5 mg/mL and 125 mg/mL) was determined using the high-performance liquid chromatography (HPLC) technique (Waters 474 scanning fluorescence detector) (6). PDB plates containing 62.5 mg/mL or 125 mg/mL of gum were inoculated with 5 × 104 fungal spores. The medium plates were incubated at 30°C for 7 days without agitation. Positive and negative controls were also run along with the test plates. Afterward, the obtained fungal biomasses were harvested and weighed. Then, 25 g of each fungal biomass with 2.5 g of sodium chloride was added into 100 mL of HPLC-grade methanol and blended for 3 minutes at 18,000 rpm. Cell-free filtrates were obtained using Whatman filter paper No.4 and subjected to analysis by HPLC. Quantitative changes in expression of the aflR gene were analyzed by use of a quantitative real-time PCR assay. A. parasiticus was cultured in the presence of 62.5 mg/mL or 125 mg/mL of gum of P. atlantica var. kurdica to be used for RNA extraction (6). RNA concentrations were determined spectrophotometrically (Biophotometer, Eppendorf, Germany). Equal amounts of RNA (1 µg in 20 µL) were subjected to cDNA synthesis by using random hexamer primers, according to the manual protocol (Fermentase). The primers Fafl (5'-CGGAACAGGGACTTCCGGCG-3') and Rafl (5'-GGGTGGCGGGGGACTCTGAT-3') were designed on the basis of the published sequence of the aflR gene of A. parasiticus (NCBI, accession no: AF441438). The b-actin gene (ACT1) with Fact (5'-ACGGTATTGTTTCCAACTGGGACG-3') and Ract (5'- TGGAGCTTCGGTCAACAAAACTGG-3') primers was used as an endogenous reference gene. quantitative real-time PCR was carried out using the SYBR green master mix (applied Biosystems, Foster City, CA, USA) performed with a step one plus real-time PCR system (applied Biosystems, Foster City, CA, USA). The PCR setup and program have been previously described (6). The aflR gene expression was analyzed with REST software (2008 V2.0.7, Corbett research, Sydney, Australia). Our results demonstrated that the gum of P. atlanticasubsp. kurdica inhibited A. parasiticus growth at MIC values of 125 mg/mL. According to HPLC analysis results, AFL-B2 and AFL-G2 production was significantly decreased and even entirely inhibited in 125 mg/mL of gum (P < 0.01). However, the production of AFL-B1 was not fully inhibited at this concentration. The inhibitory effect of the gum on AF production is shown in Table 1. Based on quantitative real-time PCR results, the rate of aflR gene expression was significantly decreased after treating the A. parasiticus with 125 mg/mL of P. atlantica subsp. kurdica (P < 0.05). The results of an analysis of the relative quantification of the aflR gene after treatment with the gum of P. atlantica subsp. kurdica are shown in Table 2. Aflatoxins are extremely toxic and carcinogenic metabolites that widely contaminate agricultural commodities and animal feed (15). In recent years, research has been ongoing into the development of new anti-fungal agents or through the search for natural sources to control growth and toxin production of Aspergillus species (8, 9, 16). In several studies, the antimicrobial activity of P. atlantica was identified. Ghalem et al. reported that the gum of P. atlantica has antimicrobial activity against gram-positive and -negative bacteria that are resistant to commonly used antimicrobial agents, and this was considerably dependent on concentration (17). Tassou et al. showed that the addition of P. lentiscus var. chia gum inhibited the growth of organisms (13). In this study, the data show that the P. atlantica subsp. kurdica had an inhibitory effect on A. parasiticus. These results agree with the conclusion of previous works (7, 18). Hesami et al. suggested the potential substitution of antifungal chemicals by P. atlantica subsp. kurdica as a natural inhibitor to control the growth of Botrytis cinereain (19). Aflatoxin inhibition mainly occurs during the primary stages of cell growth, when the genes involved in aflatoxin biosynthesis are at maximum activity within the fungal cells (7). Our study revealed that the rate of aflR gene expression was significantly decreased after treating the fungus with 125 mg/mL of P. atlantica subsp. kurdica. Mohseni et al. showed that licorice extract could efficiently inhibit aflR gene expression, and consequently, AF production, in A. parasiticus (6). In another study, Bagheri-Gavkosh et al. showed potent inhibition of A. parasiticus growth and AF production with 1 mg/mL of Ephedra major (20). Overall, we concluded that the gum of P. atlantica subsp. kurdica could efficiently inhibit aflR gene expression and the consequent AF production in A. parasiticus. This gum may therefore be considered a potential anti-mycotoxic agent in medicine or industrial agriculture. Further studies are recommended to determine the effective components of the gum of P. atlantica subsp. kurdica and to consider it as a potential candidate for controlling AF contamination of crops in the field. This study was financially supported by a grant from the Kurdistan University of Medical Sciences, Iran. We are also grateful to the Saghez Sazi (Van) company (Kurdistan, Iran). Authors’ Contribution: Study concept and design, Sassan Rezaie, Sadegh Khodavaisy; acquisition of data, Sassan Rezaie, Farzad Aala; analysis and interpretation of data, Sadegh Khodavaisy, Somayeh Sharifynia, Elham Baghdadi; drafting of the manuscript, Sassan Rezaie; critical revision of the manuscript for important intellectual content, Sassan Rezaie; statistical analysis, Sadegh Khodavaisy; administrative, technical, and material support, Sadegh Khodavaisy, Fatemeh Noorbakhsh, Elham Baghdadi; study supervision, Sassan Rezaie. Conflict of Interest: The authors declare no potential conflicts of interest. Funding/Support: The present work was financially supported by Kurdistan University of Medical Sciences, Iran.